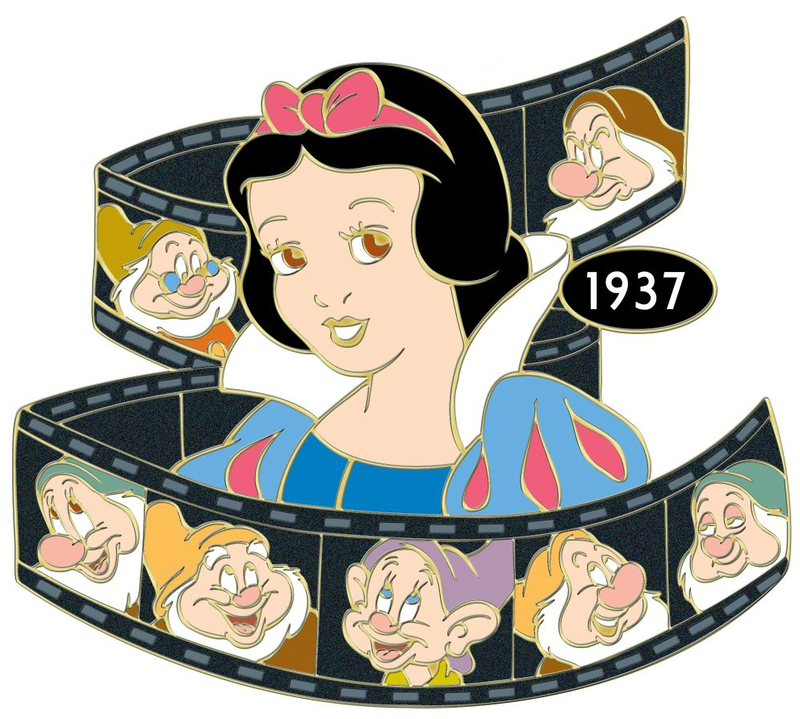 Born in 1901, Walt Disney would have been 110 years old in 2011. 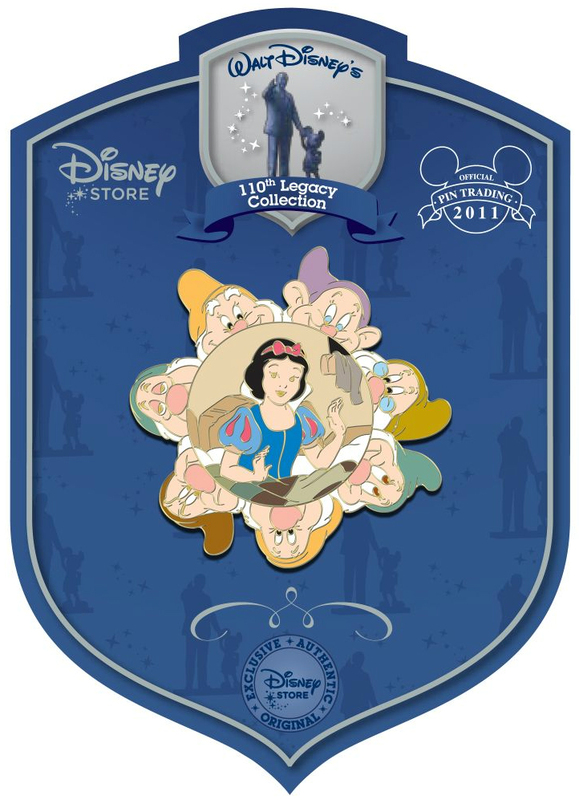 To commemorate this occurrence, the US Disney Store created a series of 110 pins called the 110th Legacy Collection, each one a limited edition of just 250. 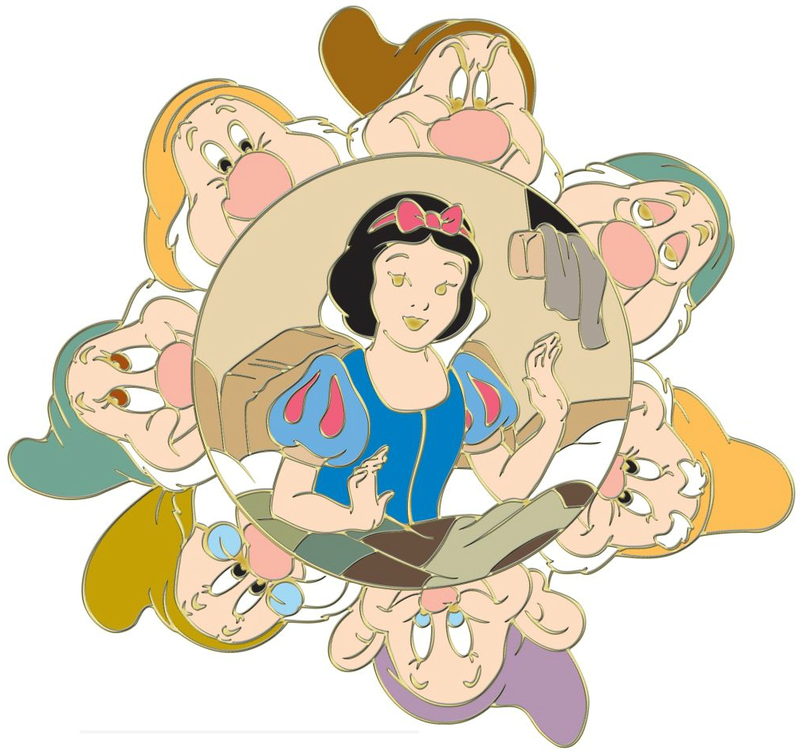 Snow White characters were included on three of them. 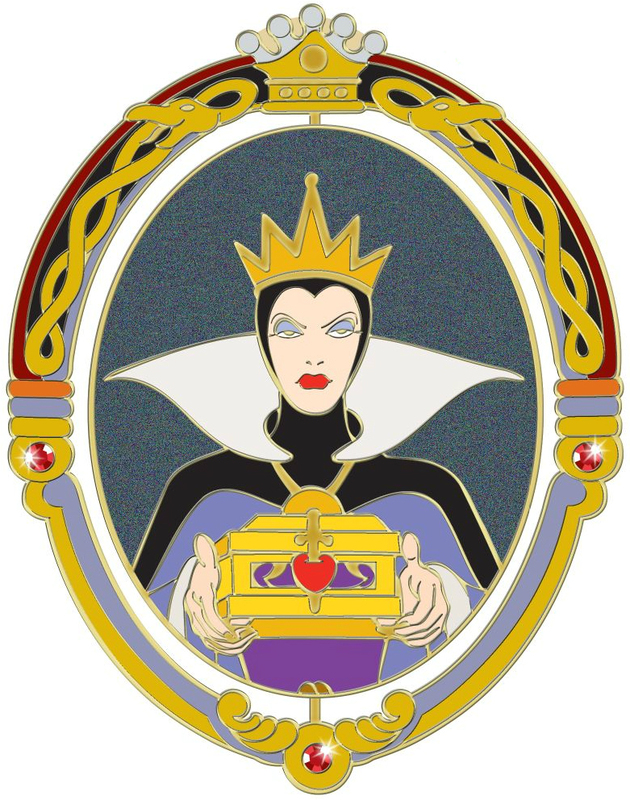 Identical pins were also sold at the Japan Disney Store but with an edition size of 110 stamped on the back side. Snow White/Seven Dwarfs spinner. Dimensions 2" x 2". Released April 2011. Retail $19.95. 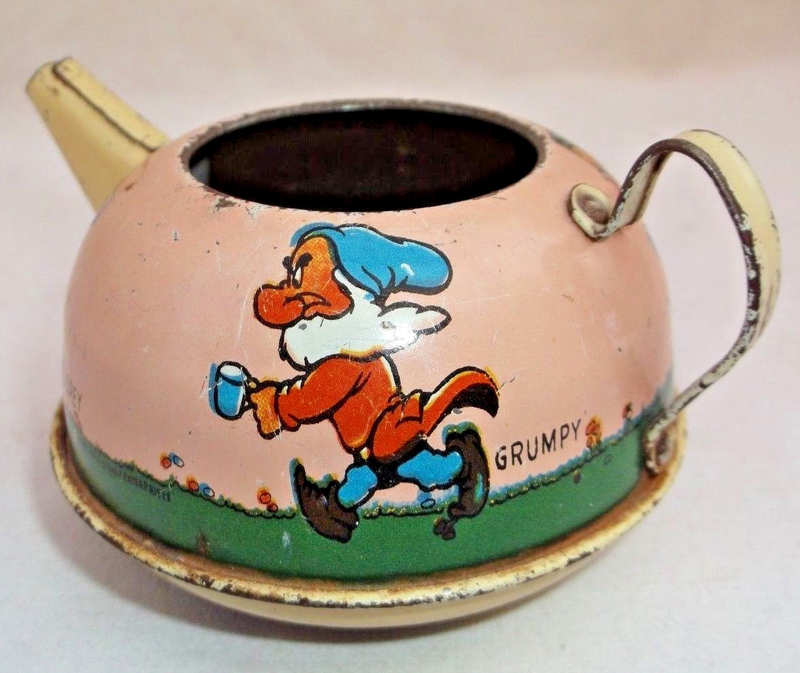 Stock images copyright US Disney Store. Pin on original US card. 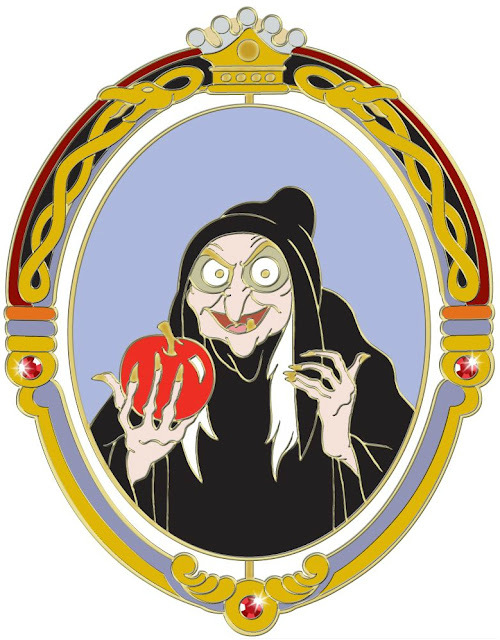 Evil Queen/Old Witch spinner. 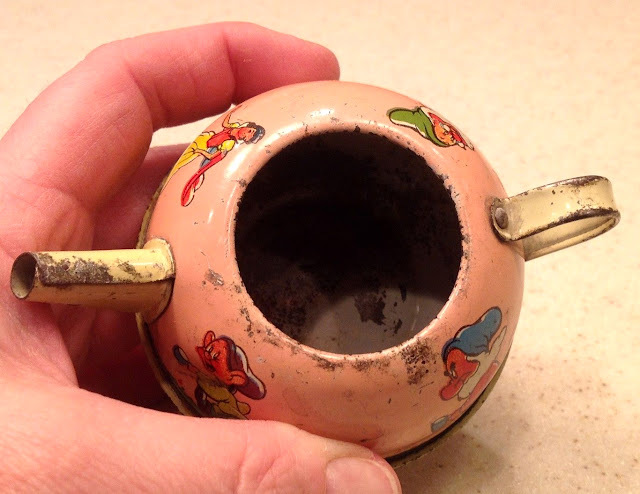 Measures 2" x 1.5". Original US card (left) + Japan card (right). 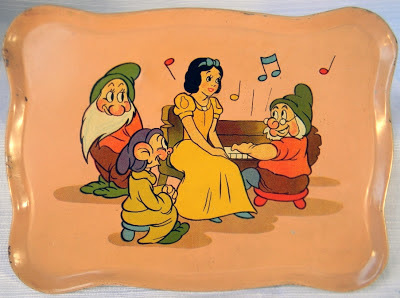 Snow/Dwarfs Filmstrip. 2" x 2.25". Released May 2011. Retail $19.95. In the year 2000, Disney Store issued a series of collectible medallions called The Disney Decades Coins. Sold separately, each featured an iconic character to represent a memorable highlight from a specific decade. The collection included a total of 55 coins along with companion info cards in protective plastic coverings. 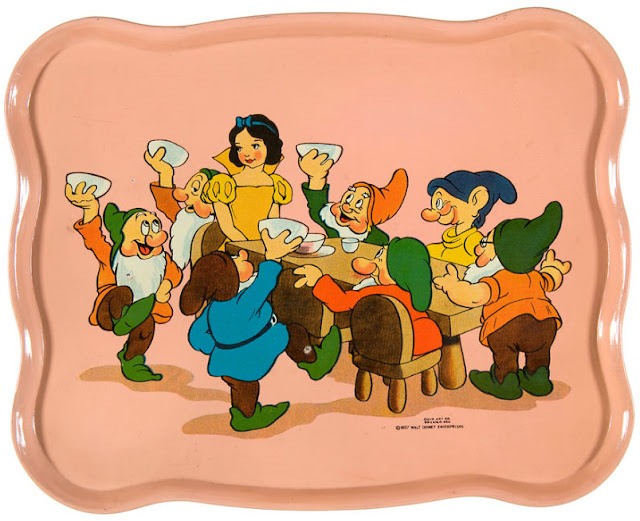 Snow White is #22, celebrating the thirties. 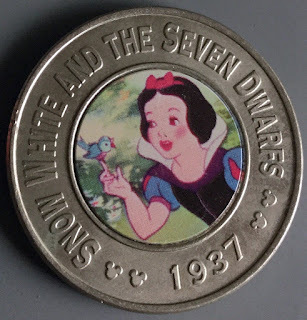 Coin measures approximately 1.5" in diameter. Package is 3" x 6". 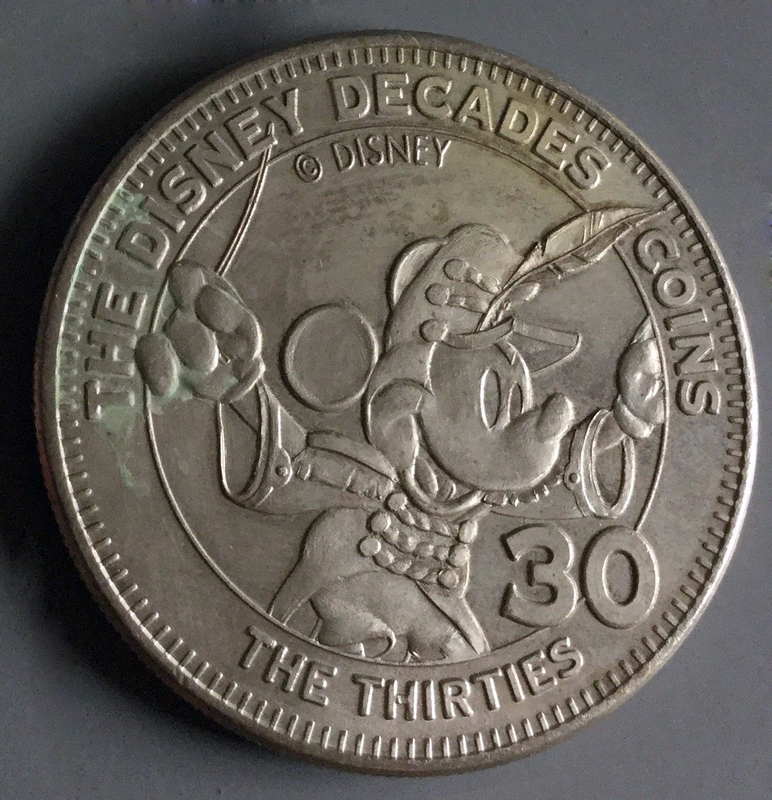 1935's Bandleader Mickey is on the reverse side. 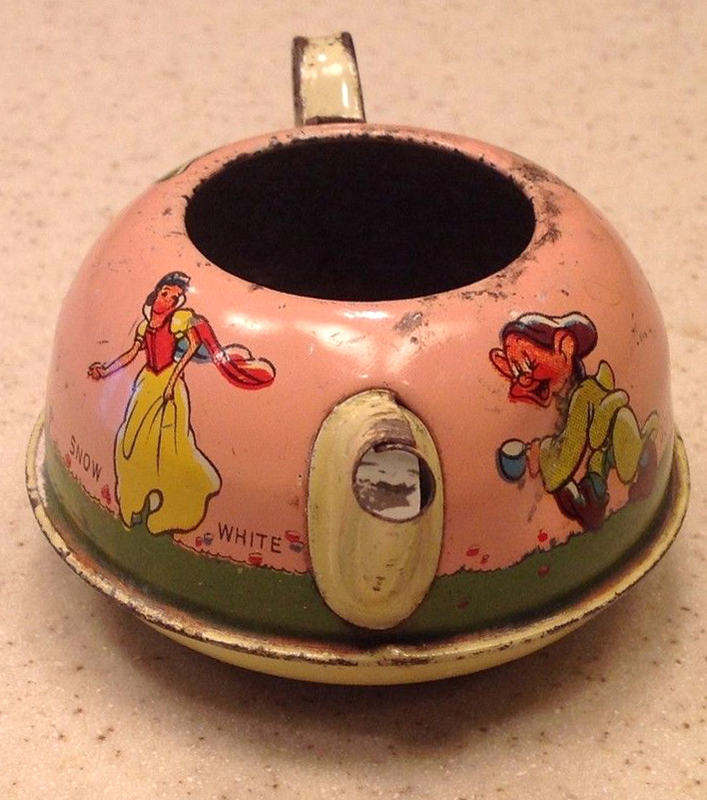 Spotted on ebay in 2014, these Snow White figures are hand-painted, one-of-a-kind lawn ornaments. Each is cut from plywood and held in place with an attached metal stake. Also includes wall mount for indoor use. Snow stands approximately 29" tall x 14" wide. 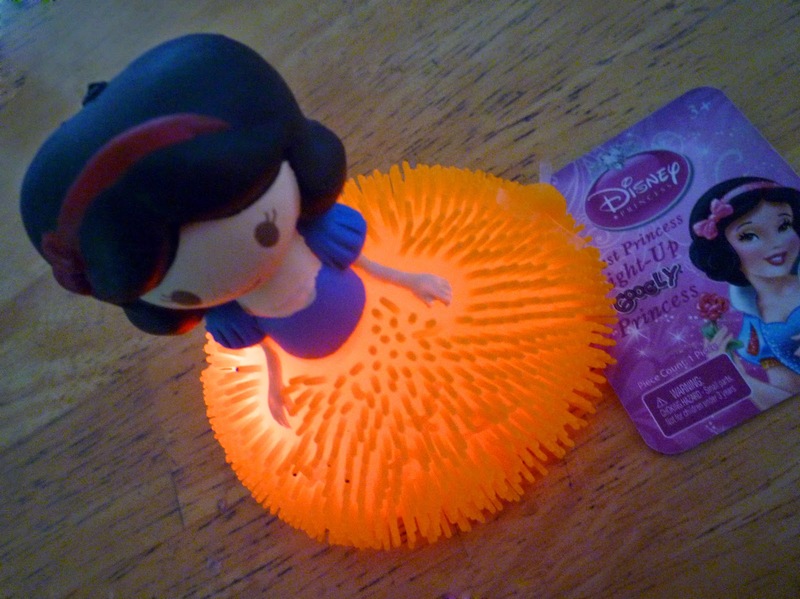 A Snow White "Light-Up Googly Princess" was found in the Valentine's Day seasonal section at Target earlier this month. 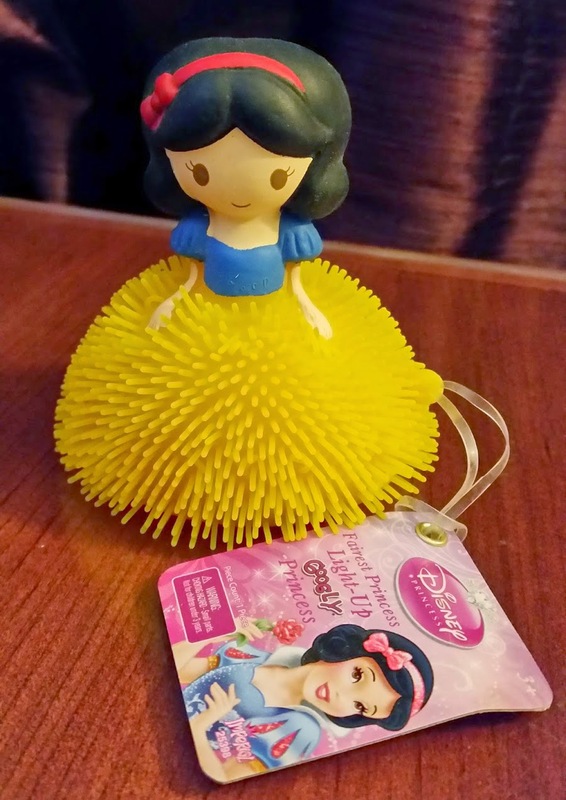 What's a Googly Princess? 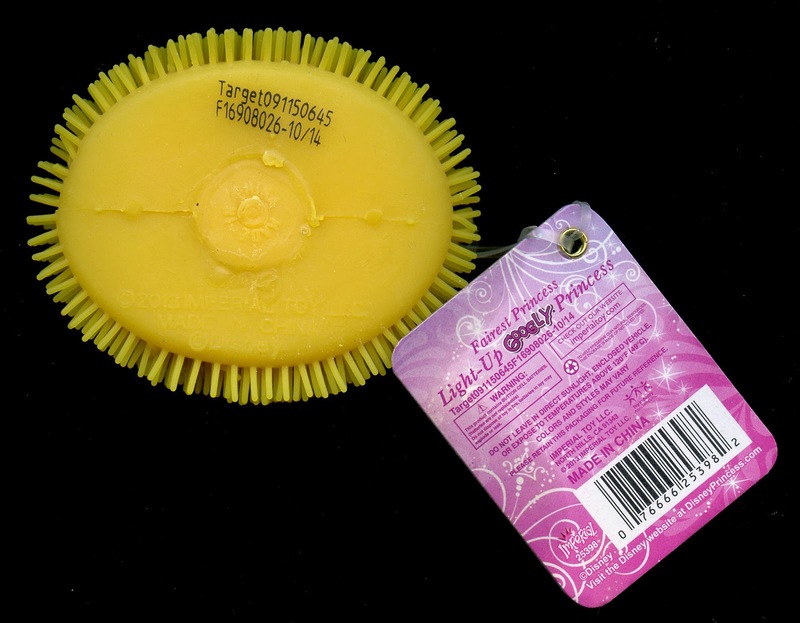 A squishy, jiggly party favor figure made from rubbery latex-like material. 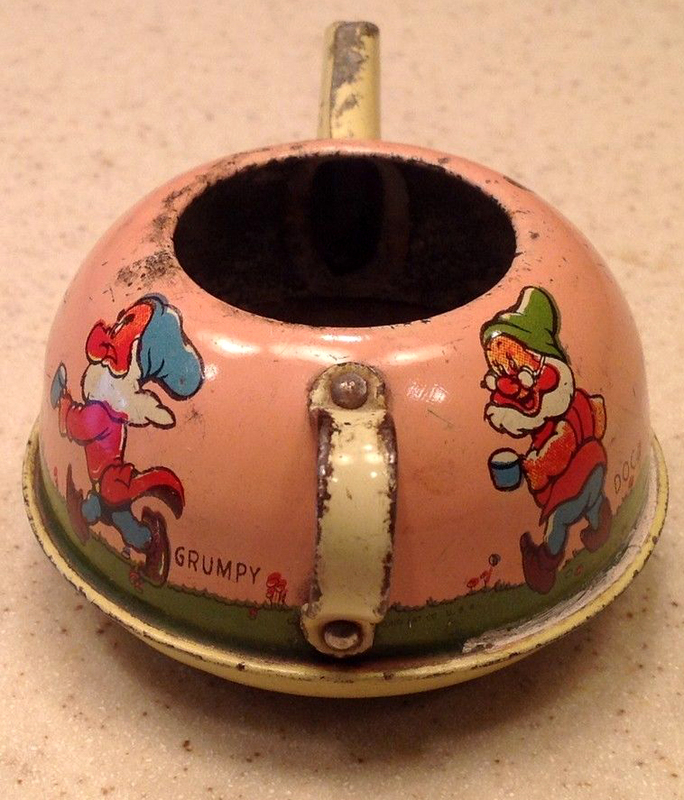 Stands a little over 3" tall. Retail just 99¢. 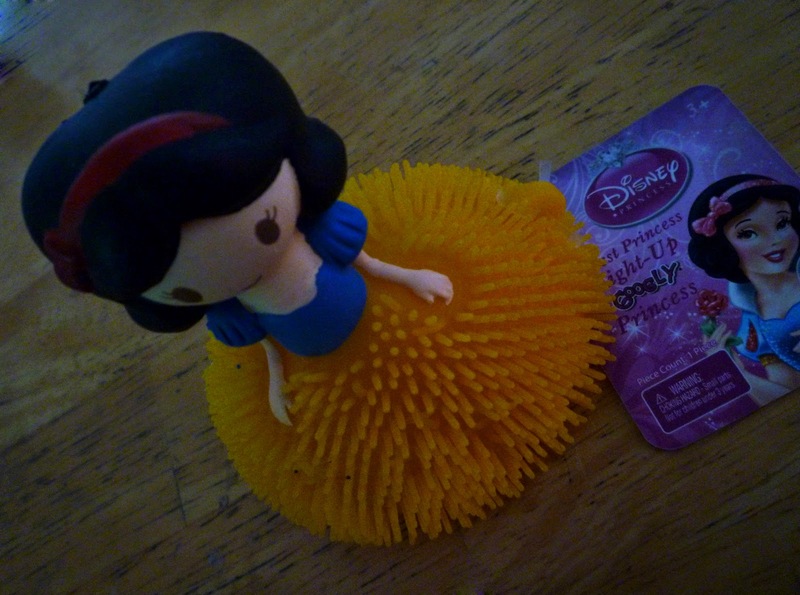 The bottom is imprinted with "© 2013 Imperial Toy LLC - Made in China - © Disney." And this particular Snow is stamped with a Target tracking number from October 2014. 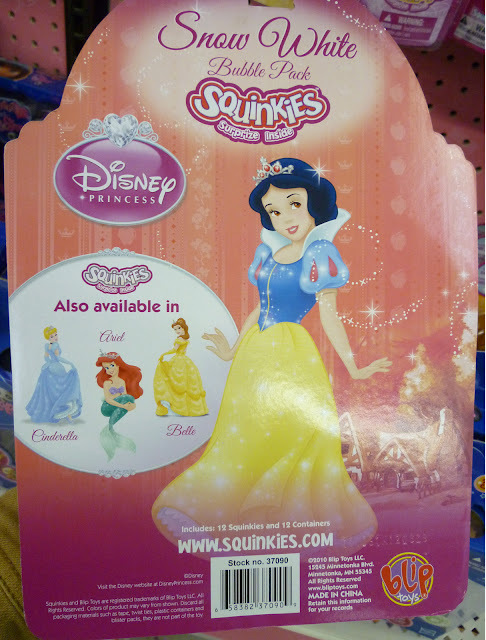 Other princesses in the series include Ariel, Belle, and Cinderella. 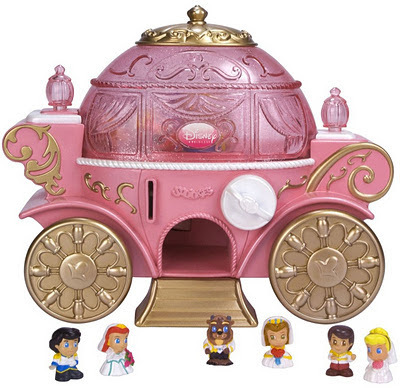 One cool component is that each figure has a small ball in the skirt portion that lights up with a red, blinking light when impacted. Powered by a button cell battery (non-replaceable). 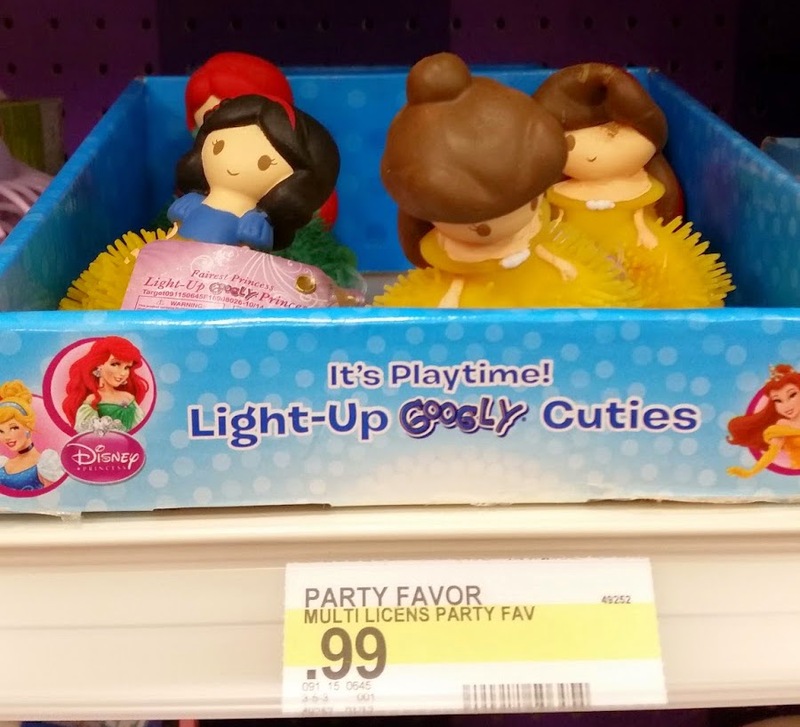 These girls were also seen in 2014 at Walgreens in the Easter section (for about $3) and later at Walmart in the toy isle. Special thanks to 1937fan at Whistle While We Blog for the heads-up on this one and for sharing additional pics. 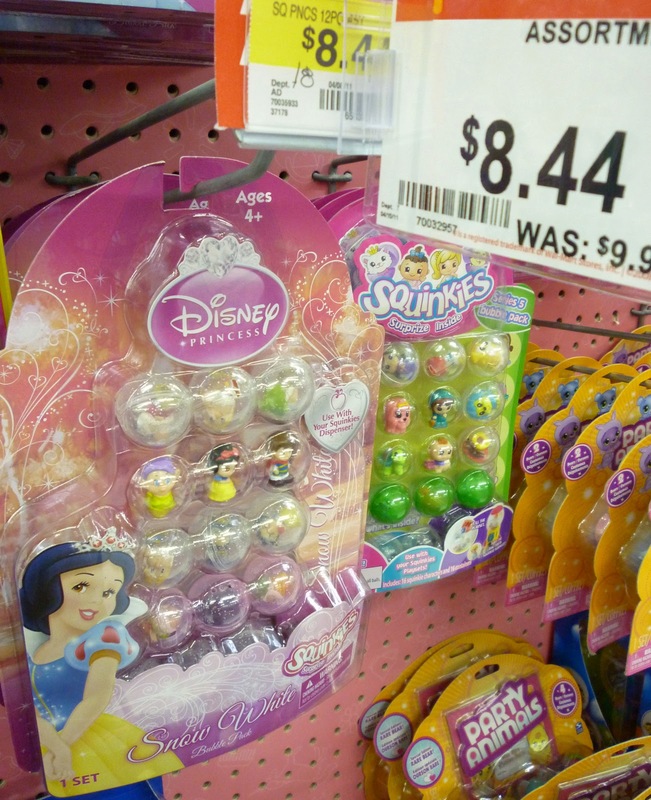 Squinkies are tiny figures (less than an inch in length) that squish when you squeeze them. Made from soft plastic (they do not contain latex). 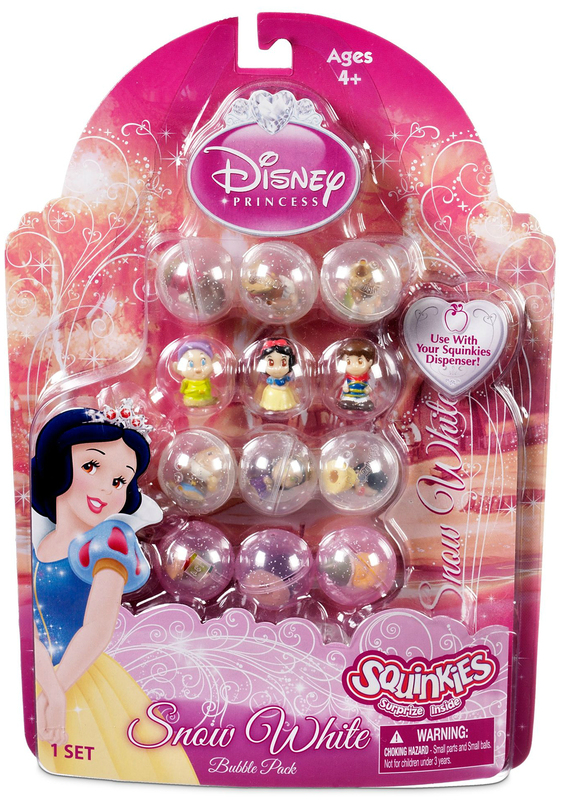 Four different 12-piece Disney princess sets were initially released, including Ariel, Belle, Cinderella, and Snow White. 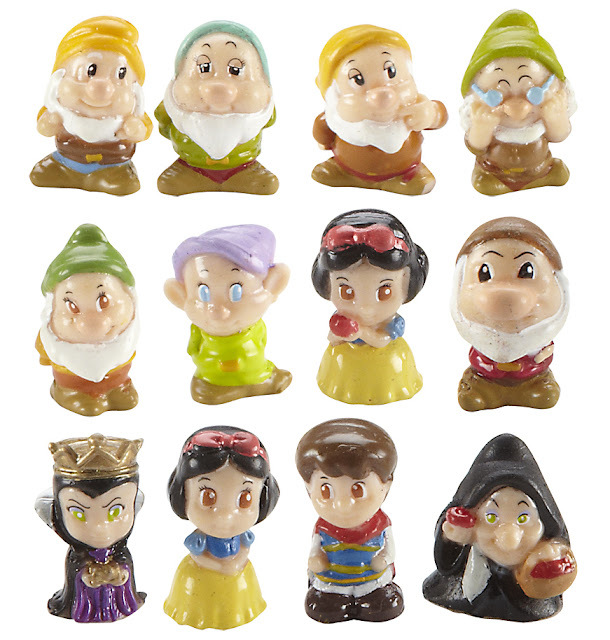 The Snow White blister pack included: Snow White, Snow White with apple, the Prince, Evil Queen, Old Hag, and the Seven Dwarfs. 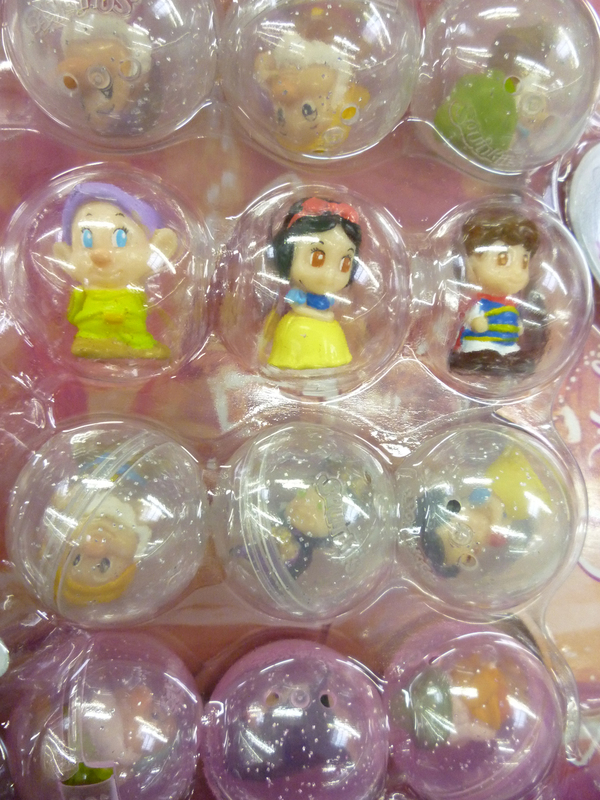 Each figure came in its own individual 1" plastic bubble sphere. The collection was available at retailers in early 2011 and appeared on the Disney Store website in December of that year. 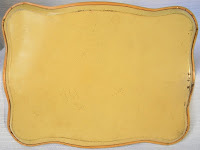 Online price $12.50. Item No. 6071048400840P. Stock images copyright Disney. Additional images via Cutetastic Disney Finds. 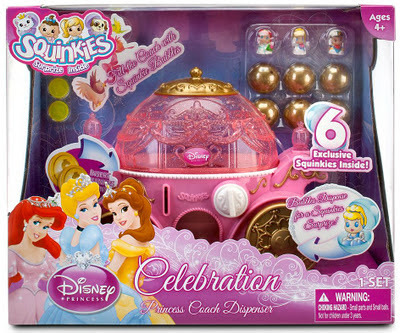 For added fun, you could use the Disney Princess Coach Dispenser (sold separately). Drop in a Squinkie coin, turn the white dial, and a Squinkie rolls down the carriage step. 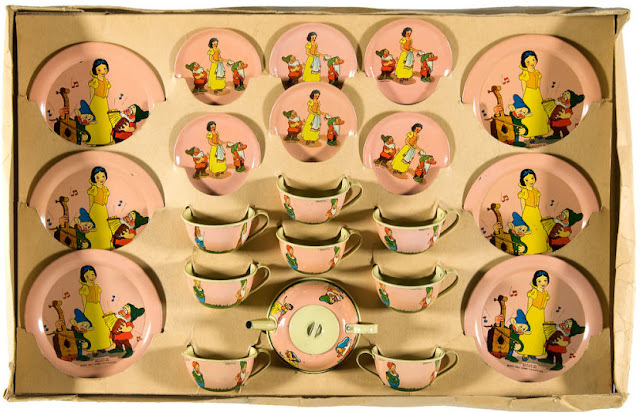 Set included four coins and six figures. Retail $29.50. 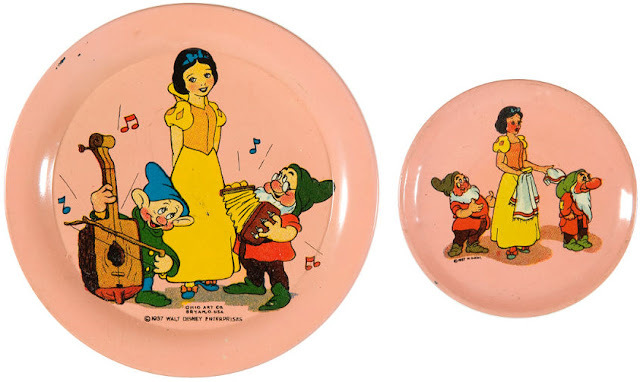 Well-known for their high quality tin lithographed toys, the Ohio Art Company of Bryan, OH was a prolific manufacturer and Disney licensee in the 1930s. 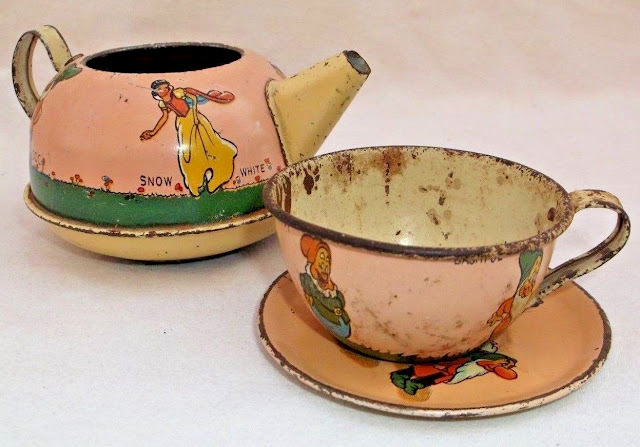 Among their myriad of items produced, the children's tea sets are probably some of the most sought-after. 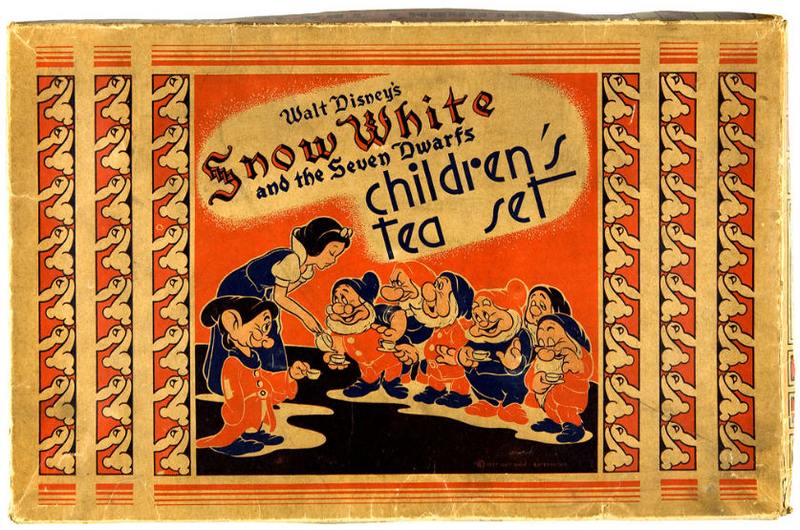 Several different Snow White packages were issued. 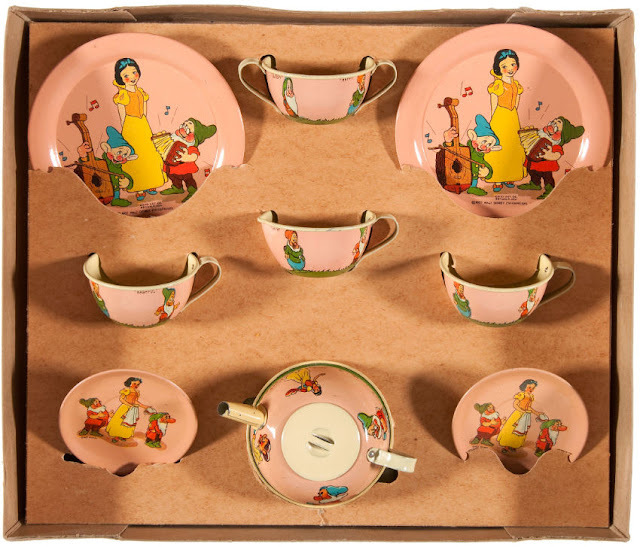 Their 22-piece boxed set (#638S “pink”) includes six servings of 4" diameter plates, 2.5" saucers, and 1.25" tea cups. 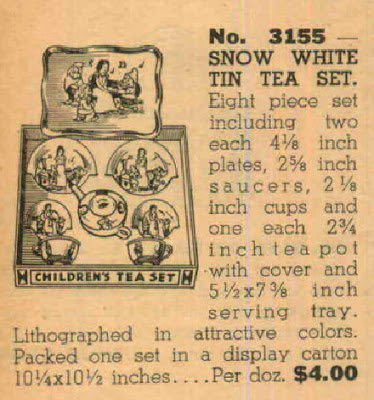 Plus one tea pot with lid, open sugar and creamer cups, and an 8" x 10” serving tray. All of the pieces feature various lithos of Snow White and the dwarfs. 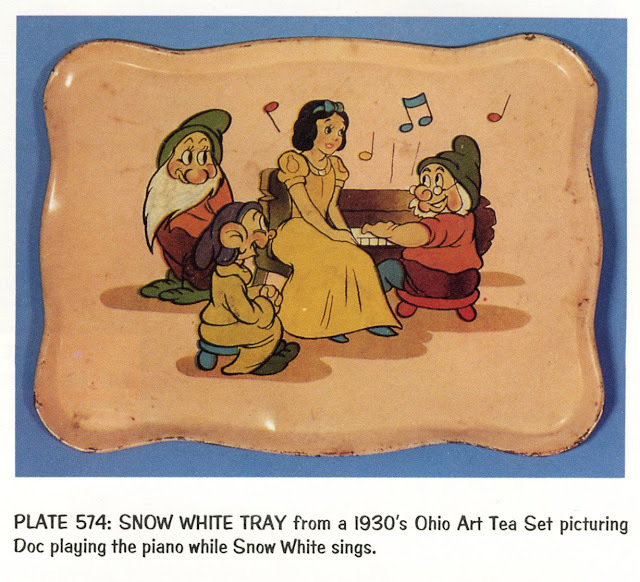 Copyright imprint reads, "OHIO ART CO. - BRYAN, O. USA - ©1937 WALT DISNEY ENTERPRISES." 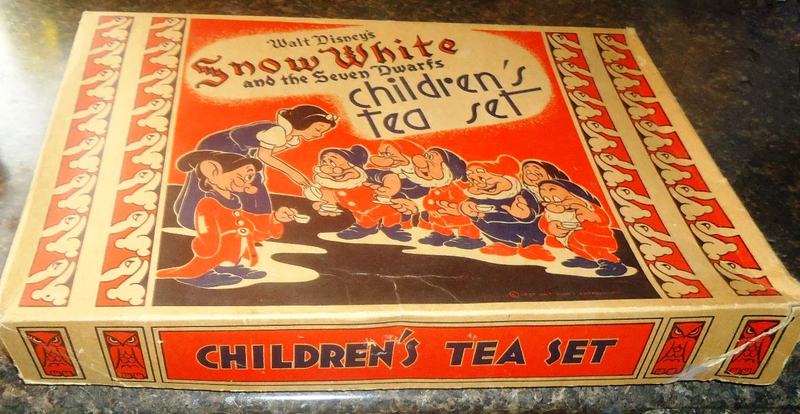 The original box measures 12" x 18" and is 2" deep. 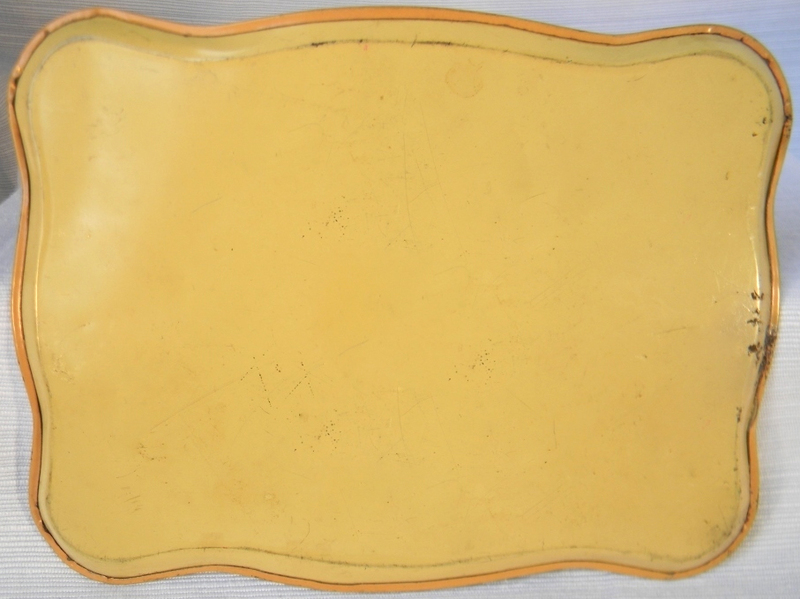 The repeating patterns on either side of the lid are of rabbits. This same box was used for other Snow White sets also. 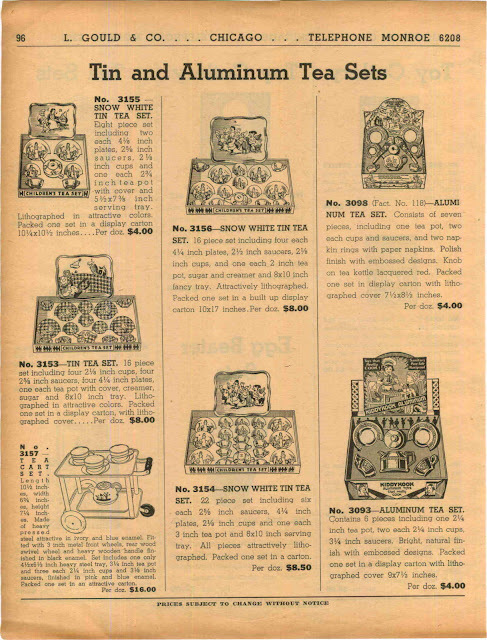 In a 1938 wholesale catalog produced by L. Gould & Co. of Chicago (pg.96), we get some solid information about what was in each package and also how much they sold to retailers for. 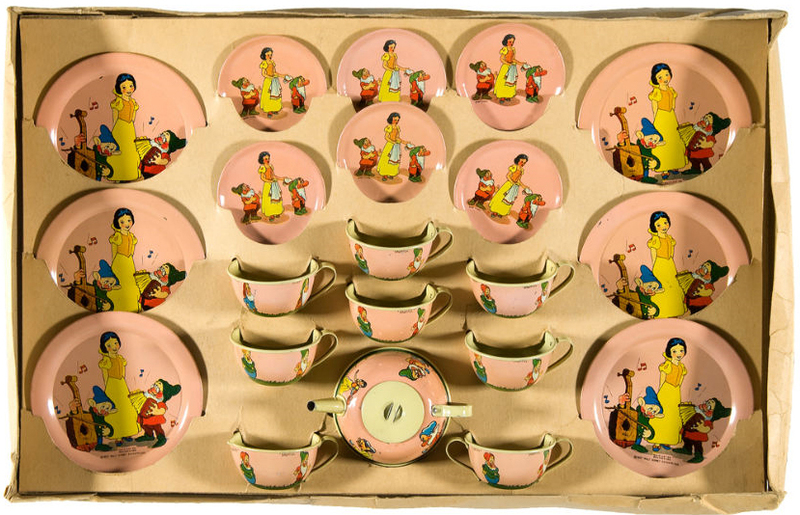 The 22-piece set above was wholesaled for $8.50/dozen. 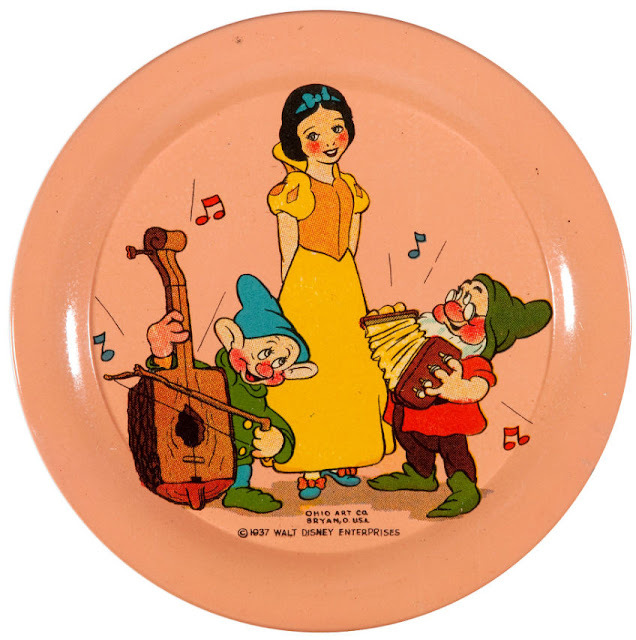 A similar 16-piece collection went for $8.00/dozen. Also listed in the catalog is a condensed 8-piece box. Dimensions 10.25" x 10.5". Wholesale price $4.00/dozen. 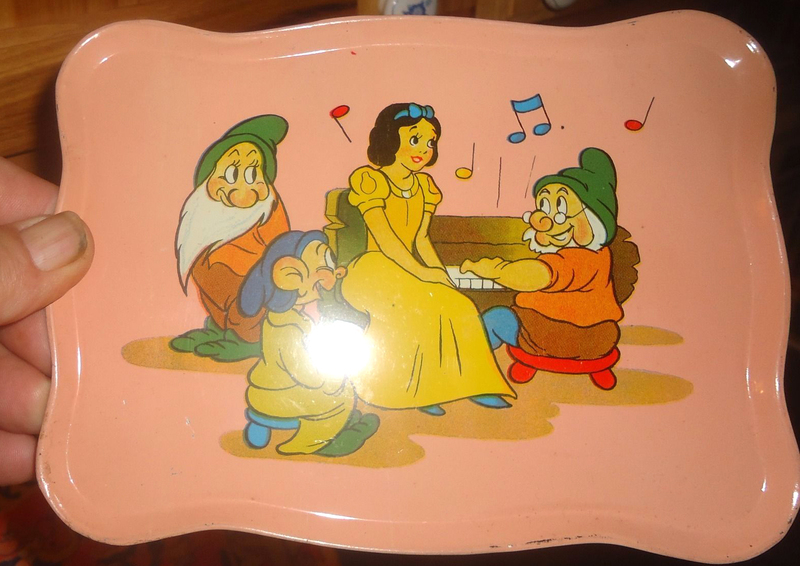 This set included a small serving tray with an illustration of Doc at the piano while Snow, Dopey and Bashful look on. Measures just 5.5" x 7.5". The tray is seen in The Collector's Encyclopedia of Disneyana by Michael Stern and David Longest, p.143 (Collector Books, 1992). Another variation was this nine-piece set which came in a 10" x 12" box (2" deep). It's marked “Children’s Tea Set” with the product #62R-8631/Pink stamped on side panel. 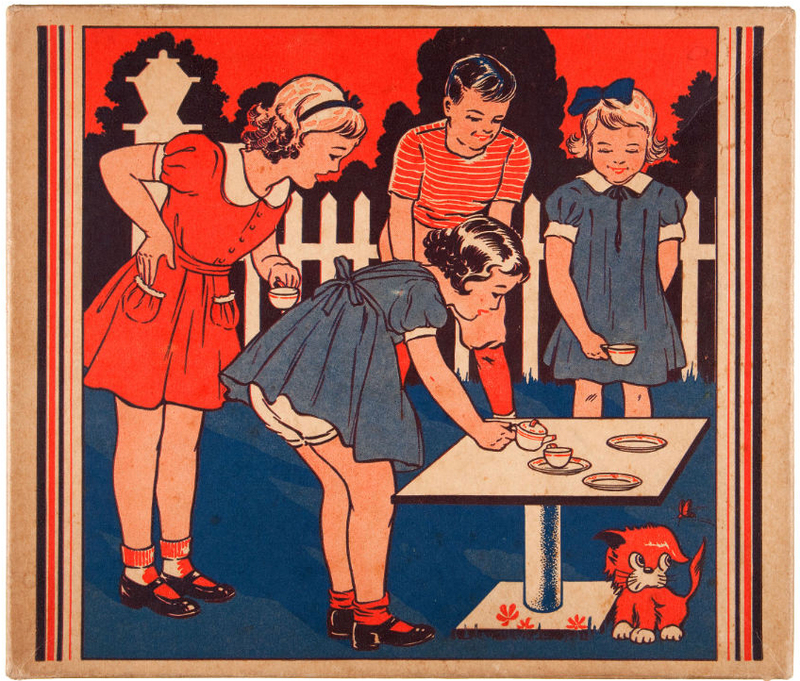 The cover illustration features three girls and a boy having a tea party together. Enclosed are two plates, two saucers, two tea cups, a tea pot w/lid, and the creamer and sugar cups. Some sets may have originally come with a serving tray as well. Boxed tea set images via Hake's. Hake's sold this last set at auction for $474.38 on November 10, 2011. We don't see many tin toys like these anymore. 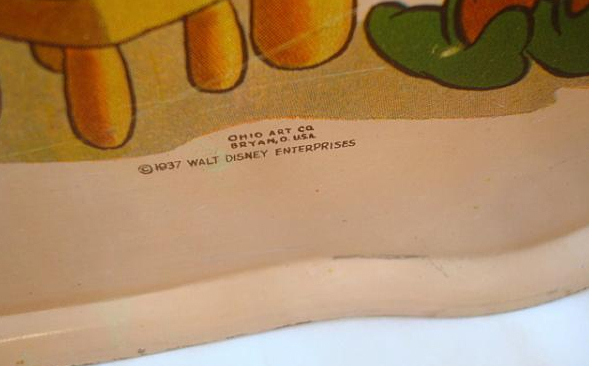 It's kind of special that Ohio Art made 'em to last.